that will both save your precious time and provide you with unparallel insight! Create as many projects you need, and assign multiple websites with a click. 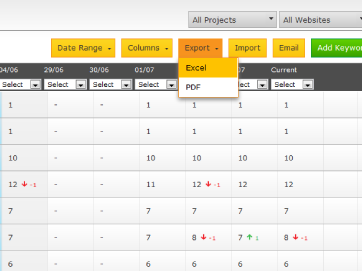 Manage and assign users to access specific projects. Grant credentials and privileges to your customers so they can see live data. At an additional cost we will even provide you with access to our platform through your own domain! Contact us (link) for details. Export valuable information to your clients with a click. Choose what to report: rankings, keyword research, analytics, links, articles and more, all selectable with a click. Schedule your reports to be sent weekly/monthly. Multiple formats available: PDF, Excel, Word. HTML coming soon. Customize your PDF report with White Label Logo and background. Let Rabbit SEO find organic keywords worth tracking. Track your rankings over time, and stay up to date with daily emails. Rabbit SEO finds your competitors based on the keywords it tracks. Create different groups to better organize your keywords (e.g. by geographic locations, high/low priority, longtails, brands, etc). 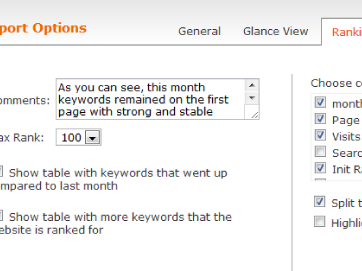 Find issues on your landing pages according to the keywords you are tracking. Use smart filters to choose which keywords to track your competitors, or choose your competitors manually. Rabbit SEO finds on-page issues so you won't have to. Manage your tasks and get due-date alerts. find all the answers you need and get quick access to our great customer service. Get alerts for live changes. 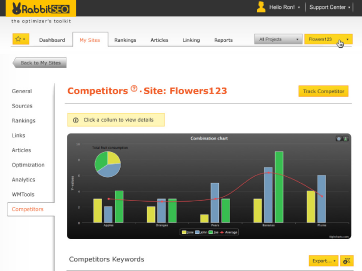 Powered by SEOmoz - Helps you discover backlinks to your website. Import or add your backlinks, save a specific links contact person, which type of link is it, what you gave in return etc. Rabbit SEO tracks your links to make sure they are all still up, and alerts you for any problems.